As you may know, Amanda and I were able to take a trip to Germany for a long weekend. 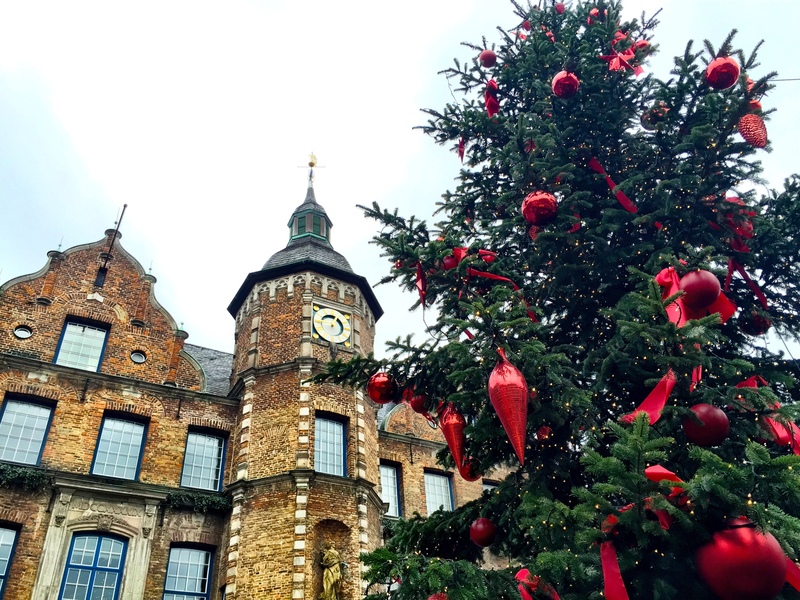 After spending our first day exploring the Christmas markets in Cologne we took to the streets of Dusseldorf to see what these markets had to offer. The markets were very similar to those in Cologne but we loved them all the same. Whether it was our unfounded need to collect every possible glühwein mug or the fact that it was our first real taste of Christmas, we kept going back for more. It turns out that it was the taste of bratwurst and not the taste of Christmas that kept us hopping from market to market in Germany. Never in my life have ate more sausage type foods in 48 hours. I regret nothing. The assortment of food we ate was awesome and the glühwein complimented it well. Bratwurst, which you may be familiar with, is a type of German sausage usually made from pork or beef and was served with a fresh bun. This was the go to snack throughout our trip and I would not be surprised if we averaged two bratwursts per market. That’s a lot of sausage considering we visited around ten different markets in both cities. Another typical food from a German christmas market is currywurst. This is simply a sliced up bratwurst covered in a sweet sauce and sprinkled with curry powder. This was served with fresh bread on the side which Amanda liked to use to make a little currywurst sandwich. So much bratwurst!!! There were a few times during the weekend that I did not know exactly what I was eating. For example there was one hut that cooking a bunch of steak and an assortment of kebabs on this huge circular grill hanging from the ceiling. Not knowing what exactly I was looking at, I ordered a kebab and it was a great decision. I am still not exactly sure what it was (I think it was pork), but this has sort have become the norm while traveling. I thought a trip to Germany meant a get away from the constant consumption of potatoes in Spain. However, I am glad I was able to try kartoffelpuffer, or potato panckaes. This german cuisine is essentially a fried potato patty, but it is not served with ketchup like I am used to. Instead, we were given a side of apple sauce to eat with it. Although surprised with my first bite not knowing it was apple sauce, it turned out to be pretty delicious. Then it was time to try dessert, which will always be on the itinerary when traveling with Amanda. To my surprise there was no chocolate treats on the menu for her (unless you count the many cups of hot chocolate). She had her eyes set on trying the apple strudel. The strudel most definitely capped off a food filled day well. I still believe that homemade german apple strudel is no match for homemade apple crisp (wink wink mom… I’ll be home in about a week). Other noteworthy food we were able to sample in Germany were their sautéed mushrooms served with garlic sauce and authentic german soft pretzels. Following the trend, these were delicious as well. It was amazing to experience a different Christmas atmosphere in Germany and the good food was an added bonus. It gave us a chance to catch up with one of our best friends from college and get into the christmas spirit at the same time. If you ever find yourself in Germany during the christmas season you must check out the markets. Do not be afraid to try the food even if you don’t know what it is, order it anyways. Also, glühwein! You can never go wrong with it and it’s a great way to stay warm. Not to mention it helps wash down all that food! Pretty soon we will be seeing what Amsterdam and Brussels have to offer. I can only hope that the food is half as good as the food from the christmas markets! P.S. – Enjoy the video blog! We did not get any clips of us talking about the markets because we were too busy stuffing our face!